About a month ago I stumbled across something called “My Retro Game Box” on my friend’s Facebook feed. It was another one of those box-a-month subscription programs where they fill a box with random goodies and send it to you, except this one was specifically retro video games. Obviously I was immediately interested. I did some research and found out that it’s a relatively new, small mom & pop operation run out of Scotland. Now my collection has gotten to the point where the games that I am missing are very specific, so I was a little skeptical about signing up for a subscription where I would be sent random games. But I was curious enough to see how it all worked out, so I signed up for 1 month just to check it out. They’re very friendly and right off the bat they send you a questionnaire asking you to list all the games you have for NES, SNES, Genesis/Mega Drive, N64, Sega Master System, Game Boy, and Game Boy Advance and then even asked what game preferences you had and said they would strive their best not to send you things outside of your personal tastes. One of the things I found most intriguing, is that they give you the option to get PAL or NTSC games. Doubtful it would ever reach me, but I’d love to see Probotector, the PAL version of Contra where everything is a robot, arrive in one of my boxes. They give you the option to do subscriptions by 1 month for £23, 3 months for £65, 6 months £125, and a year for £230. All those prices are in British pounds sterling btw, for those who didn’t understand what they funny symbol was. I was glad they single month purchases for those who wish to remain noncommittal and it allowed me to take just a taste of what they had to offer. A few days ago, in my mailbox was a unassuming, nondescript, small, rectangular, brown box. 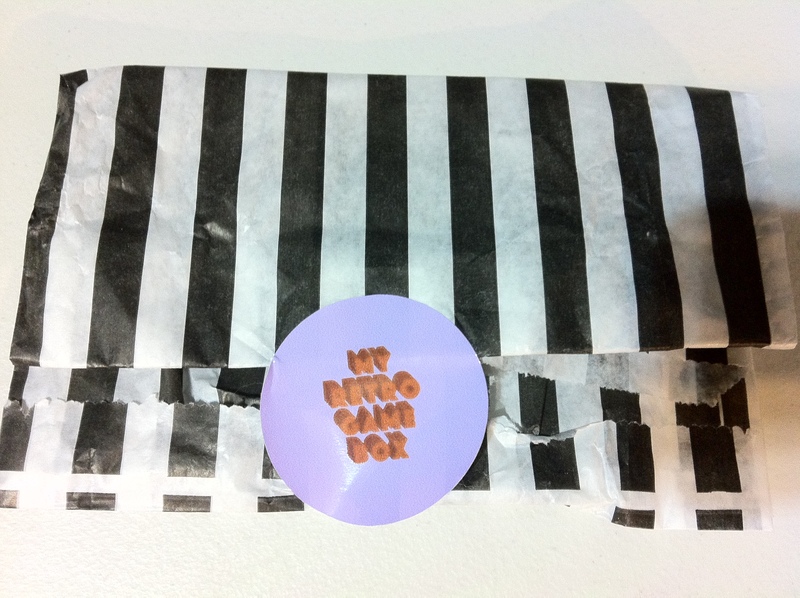 And I never would have known it was from a subscription service if it didn’t have a little round sticker on it from, “My Retro Game Box.” To add to the mystery of what games you are randomly sent, they place them in these delightful little striped paper bags. I ended up getting Wrath of the Black Manta and Defender of the crown, both for the NES and both rather ho-hum games. But I also got Dr. Mario for the Game Boy and it was the PAL version, so I was happy about that. I’d actually rather get PAL games. Feels more exotic. Overall, I’m pleased with this service. I decided to go for another month more out of curiosity than anything else. There’s something exciting about random video games. With ebay, Craig’s List, Amazon, etc, the thrill of the hunt is gone. I don’t expect to ever get Earthbound, or Chrono Trigger or anything of course, but there’s almost 800 games for the NES alone and I don’t even have half of them. My only complaint with My Retro Game Box would have to be their website. It’s rather bland and unintuitive. I understand that they are just starting out and it’s only like 2 people working on it, so I can look past it. Been doing a lot of longplay vids lately. Posting some of my more favorite ones below. Anyone interested in doing some co-op longplays, drop me a line and come be a part time member of the Squad. The first official Gamesquad Squad Turbografx longplay. Currently, it will also be the only one for awhile since immediately after playing this, the sound went out on the system, so now I have to replace all the caps. Just waiting for them to arrive. Quick interesting fact about this: My game is apparently glitched and I never knew that until I saw what the game is actually supposed to look like. The floor on the first stage is totally broken. There are many that feel that the only true RPGs are the classic, turn based, sprite infused, Japanese style RPGs. Now J-RPG is almost a dirty word since a vast majority of them that come out of Japan are piss-poor, terrible, games. Sorry, but it’s true. Star Ocean: The Last Hope doesn’t hold a candle to Mass Effect. But as much as I do love Mass Effect, it’s just not the RPG I want. It’s a great game, but I would never put it at the top of my favorite “RPG” list. Lost Odyssey was a good shot, but what’s that, 1 game? 1 good true RPG for an entire console generation. One answer to this problem has been RPG Maker. RPG Maker has been around for quite awhile now and I just wanted to introduce everyone to the library of community built games out there. 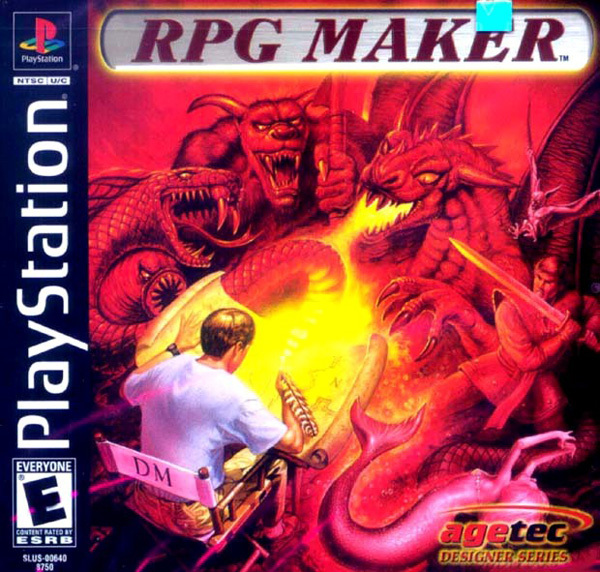 I’m not talking about the RPG Maker games that were available for PS1 and PS2. Those were cool ideas, but since the internet wasn’t readily available to those systems, those programs could never reach their true potential since you couldn’t really share this information with a widespread audience. I was first introduced to RPG Maker with RPG Maker 2000. This fantastic program made it very easy to create your own 16 bit RPG. It came with a ton of preset tiles, characters, sprites, sound effects, music, etc. and a bunch of tools to help you create your own. Plus fan made websites began sprouting up with full games they made you could download for free, or extra tools or tips you could use to build your own game. RPG Maker VX is the current iteration of the series, which is no longer free unfortunately. Actually, I’m not sure if RPGM2k was ever free, I just remember i didn’t pay for it. Anyway, if you want to get the older version, it’s still available and easy to find. If you want the most recent version, you can get it from the official RPG MAKER website. They do at least give you a trial period if you just want to check it out. This is the game that introduced me to RPG Maker. I don’t remember the specifics, but I know I was doing a search for Final Fantasy stuff and I stumbled across this. “What’s this? !” I exclaimed, and frantically located where I could download both the game and the program to run it. Endless Nova really has nothing to do with the franchise, other than that its creator thought the game they were making was worthy of sharing the Final Fantasy title. Honestly, it’s a pretty damn good game that could easily follow in the footsteps of its SNES brethren. It is of course much shorter, has some spelling errors, and doesn’t have the privilege of being touched by Nobuo Uematsu. However, the intro screen has a midi version of the Serial Experiments Lain theme song. Not that I’d compare that to Uematsu. Abandonia everything you need to play it HERE. Yes, this is the title and yes, the game is as awesome as the title. By far my favorite on this list. First, a quick lesson; Gaiden translates into english as “tale” or “side-story”, usually used when a story has a spin-off from its original but not necessarily a sequel. For example, Joanie Loves Chachi, a spin-off from Happy Days, could alternatively be called Happy Days Gaiden. Also, saying the word as “GAY-dun” is wrong. The appropriate pronunciation is “GUY-den”, so please correct yourself. If it sounds like I’m being pushy, I am. We Americans have been saying Ninja Gaiden wrong for over 20 years now. It’s time to make a change. 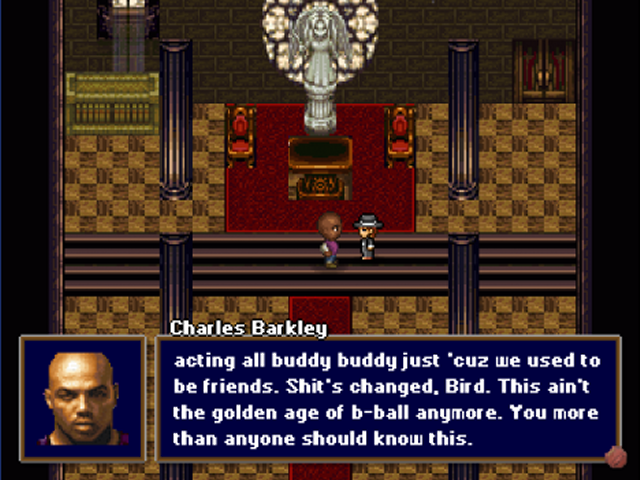 But I digress… Barkley, Shut Up & Jam: Gaiden follows the story of Charles Barkley and his son, Hoopz, years after basketball has been outlawed due to the catastrophic Chaos Dunk, a “jam so powerful its mere existence threatens the balance of chaos and order”. His former fellow pro B-baller, Michael Jordan, is now part of B-Ball Removal Department, and where they were once rivals on the court, their rivalry now threatens the life of Charles and his son. Unlike the rest of the games mentioned today, this one isn’t free. It’s not too expensive, only $14.99, but still a bit much for an indie game (there is a free trial at least). Why isn’t this one free you ask? You’ll see once you play it. The level of production that went into this game far exceeds any others and they used way more than the tools that are supplied with the program. All of the main characters are created from scratch. 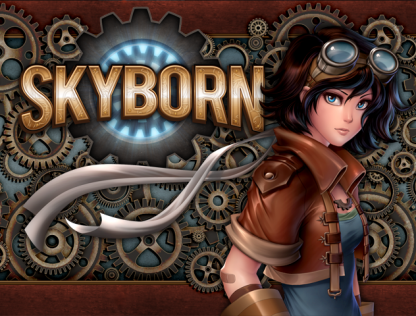 It has a well written storyline set in a Steampunk universe. I think this game could have easily been a console original. A Japanese only Square Enix production for the Super Famicom. Radical Dreamers was a side story for Chrono Trigger and served as the inspiration for Chrono Cross. Much of the music and characters featured in Radical Dreamers appear in Chrono Cross. Although there was never an official English release, translated roms are available. So if there’s a translated rom for it, then why did someone make a version with RPG Maker? That’s because it’s a text based game that kind of reads like a choose your own adventure book. The goal of this project is to capture the feel of a true Chrono Trigger sequel as much as possible. It’s too bad that it’s never been completed. Or if it has, then I am painfully unaware and somebody, PLEASE, send me in the direction where I can find it. Tales of the Drunken Paladin – This is your classic 16 bit, turn based, fantasy RPG, only it’s not. It plays like one and looks like one, but doesn’t have the sensibility of one. Absurd character names, contemporary dialogue with a silly tone, and a story where the main character is a cross between Joxer from Xena and Booger from Revenge of the Nerds. That may not be entirely accurate, he’s a better fighter than Joxer. Kingdom Maker – Interesting program used to make something apart from an RPG. Part tower defense, part city builder. I don’t know if this game is technically complete or not though, but it seemed kind of bland. Liked the concept though. Ghostbusters – Too awesome not to check out. 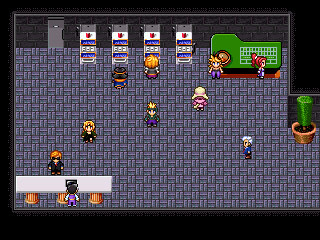 The developer used a lot of art from the comic books and did a good job of doctoring the sprites. Battles are fought Dragon Quest style. The Silmarillion – Nirnaeth Arnoeidad – As far as I know, there has never been a game about The Silmarillion. As a Lord of the Rings fan, I was very curious about this one. I’ve never read The Silmarillion in its entirety so I really don’t know how accurate the game is. It’s an interesting story though if you’re a fan. Lots of backstory about what happened many, MANY years before Sauron became the all powerful dark lord. Only downside of this game is that the backgrounds are extremely bland and makes it feel incomplete. Valhalla – A card battle game. Wasn’t really my cup o’ tea, but it was interesting to see someone make a card game out of an RPG mechanic. I too had my own RPG years ago,simply titled, Mr. T’s Adventure. You played as Mr. T and one morning you awaken to find that your gold chains have been stolen by some fiend. Mr. T roars in anger, chugs a whole carton of milk and throws it on the floor shattering it (yes, shattered a carton, for Mr. T is such a man of brute force, and his rage so furious, that he can shatter cartons), gets in his van and then the adventure begins. Months into its creation, my computer broke down and I was unable to recover the data from my hard drive. I did have back up files, but somehow they had become corrupt. I guess the universe didn’t want this game to exist. I was too heartbroken to ever remake it, thus this adventure never came to fruition.